We were rained out this Fourth of July. A storm came through right at nightfall. The local fireworks show was postponed until July 5th, but we weren't allowed to do our personal ones (at least, not in the city limits...we could probably take them up to the Farm and do them, but we aren't planning to). Still, I think Miss M had a mighty fine day. She's always begging me to let her play in the rain, but most of the time there's too much thunder and lightening to allow her that pleasure. This time, however, the rain was warm, there was no thunder, and I let her stay out till lunchtime. Unfortunately, she was wearing the Fourth of July Dress I made her and she had to change into dry clothes before I got a chance to snap her picture. I finally got her to put it back on today for a quick photo session. 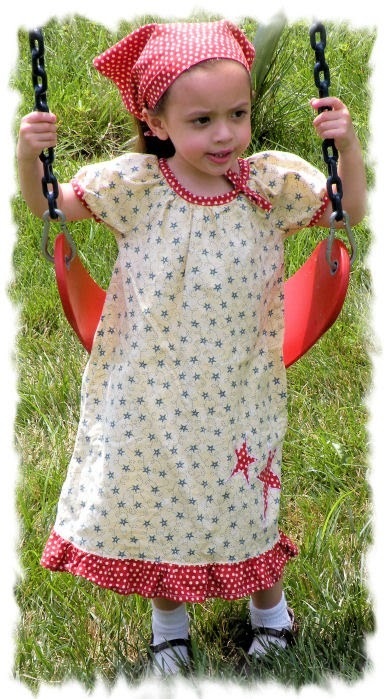 I used the "Polka dot blouse" pattern (#16 from Ottobre 1/2008) in a size 98. I really like this pattern because it's cute and comfy and has no buttons, zippers, or elastic! Size 98 is a it big for Miss M, but for this particular pattern it doesn't matter too much...plus, she'll be able to wear it next year! The changes I made were to cut the sleeves short and lengthen the hem (at an A-line) about 14 inches. I added a ruffle about 1.5 times as long as the lower edge circumference. The headscarf is #40 from Ottobre 3/2010. I have one more dress in the works for Miss M and then I'm planning to turn my thoughts to fall and winter. Both kids have enough for the rest of the summer, but they'll both need things for cooler weather. I need to figure out what sort of a SWAP to do. Insanely ambitious with one for each kid? A mini SWAP for each kid? Just jackets? What about a bit of sewing for me? Hmm...decisions, decisions.